Airports are often windy places, many are located near to the sea and are exposed to strong winds. Containers being blown around is not unusual, indeed all too often it is taken for granted. 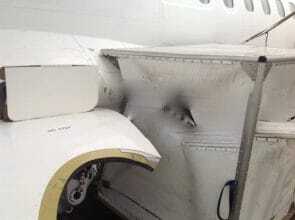 ULD are all too often inadequately restrained against high winds of jet blast and end up in unsuitable places, often with significant damage to the ULD and sometimes to other equipment and even aircraft. The correct approach to preventing such occurrences is to properly secure ULD in suitable racking, and not just leave them around the ramp or other areas where ULD are found. 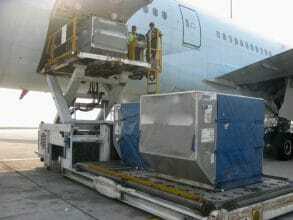 One area where restraining a container against high winds is while its on the cargo loader. The design of a cargo loader platform is such that there is no kind of vertical restraint to the container while its on the loader, and while the container is on the loader it is vulnerable to high wind speeds. Go back 40 years to the early days of wide body operations, ULD were a great deal heavier and the risk of them being blown off the loader was far far less. Indeed the aircraft has limits on wind speeds above which the cargo doors may not be open, going back to the 70’s when an AKE weighed maybe 120 Kg it would have required 42 Knots of wind speed to tip it over, a wind speed that is higher than the limits on some aircraft. Today however the picture is totally different, as a 55 Kg AKE will tip over at 29 Knots… which is described on the Beaufort Scale of wind speeds as a strong breeze, in which an umbrella may only be used with difficulty! Fortunately the basis for calculating the effect of wind speed on a ULD can be derived from International Standard Organisation (ISO) standard 11995 “ Aircraft- Stability Requirements for Loading and Servicing Equipment. Although this standard does not refer to ULD as its focus is on items like catering trucks it does nevertheless provide the basis for doing the calculations necessary to determine when the wind speed is sufficient to cause a container to tip. The ULD CARE wind speed limit calculator allows the user to select the ULD type from a drop down list that covers most container types, put in a tare weight and the wind speed at which the ULD will tip is calculated. It is possible that a container might tip at a lower wind speed, in case of particular wind turbulence around the container, so the formula should be used with caution but as a guideline for determining the wind speed at which the loading and unloading of empty containers to the aircraft its a pretty reliable method. Use the whole table or select a ULD type. Input tare weight (kg) for each ULD type. Get the wind speed values at which the container will start to tip*. 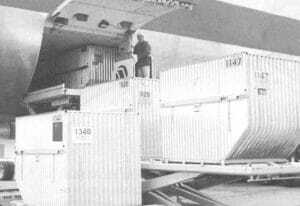 *Note that it is possible that a container might tip at a lower wind speed, in case of particular wind turbulence around the container, so the formula should be used with caution but as a guideline for determining the wind speed at which the loading and unloading of empty containers to the aircraft its a pretty reliable method.